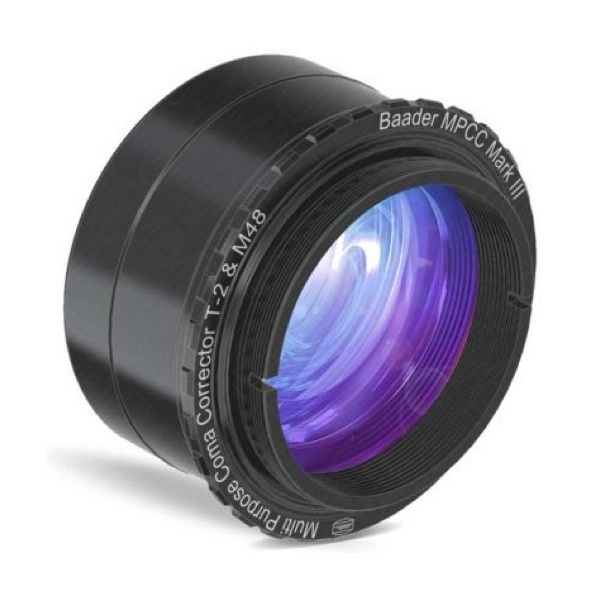 This great product from Baader now allows you to use your Newtonian telescope to take stunning wide field photographic or digital images of the night sky, or just use visually for much wider views, while at the same time keeping stars pin point sharp to the edge of field, this is all done with no increase in magnification so images stay bright and sharp. This is the only coma corrector that does not increase focal length, not does it reduce field size of your Newtonian - an f4 Newtonian remains f4. of view. An f4 optics may become an f4.5. The Multi Purpose Coma Corrector Mark III eliminates coma across the full photographic field without manipulating the focal length. The proprietory lens design has our Phantom Group© wideband multicoating on all air to glass lens surfaces. This treatment delivers highest transmission combined with lowest amount of scatter and reflections across a very wide spectral range from UV to NIR. The original MPCC had been designed for an f/ratio of f4.5 to f6. The new Mark III however works exceptionally well even down to f3.5. stars remain pinpoints across the field and the visual use likewise is made much easier - with the help of the 2" (M48) male filter thread at the eyepiece facing side. The MPCC III is designed to be the most variable coma corrector in the market today. It mounts into every 2" focuser and fits CCD-filter wheels and off axis guiders of various manufacturers.